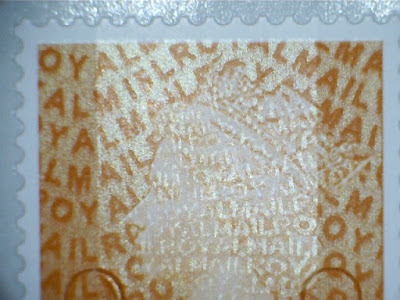 News update: slogan postmarks, Post and Go stamps, and a new machine. Royal Mail's press release on the risks of identity theft and fraud did not include any mention of a nationwide slogan postmark about National Scam Awareness Month. Thanks to Mike and Adrian for providing these examples of the slogan, from Bristol and Warrington Mail Centres, both on 20 July 2015. 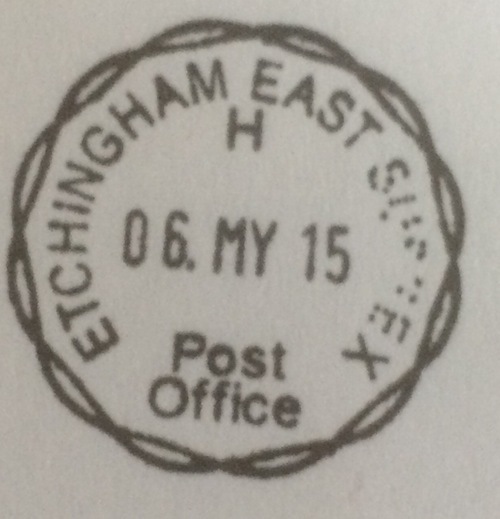 I ordered a Machin Post and Go collectors pack from Tallents House last week, I was surprised to find that the Airmail stamp was printed on MA13 stock, the other two 1st class ones were undated. Strange that the stamps should be printed from different stock, but I suppose each stamp is printed multiple times on a roll and then cut for inclusion in the pack. So each stamp could be printed on a differently-dated roll! UPDATE 26 August: Mike reports (19 August) a later purchase from Tallents House contained only undated stock! 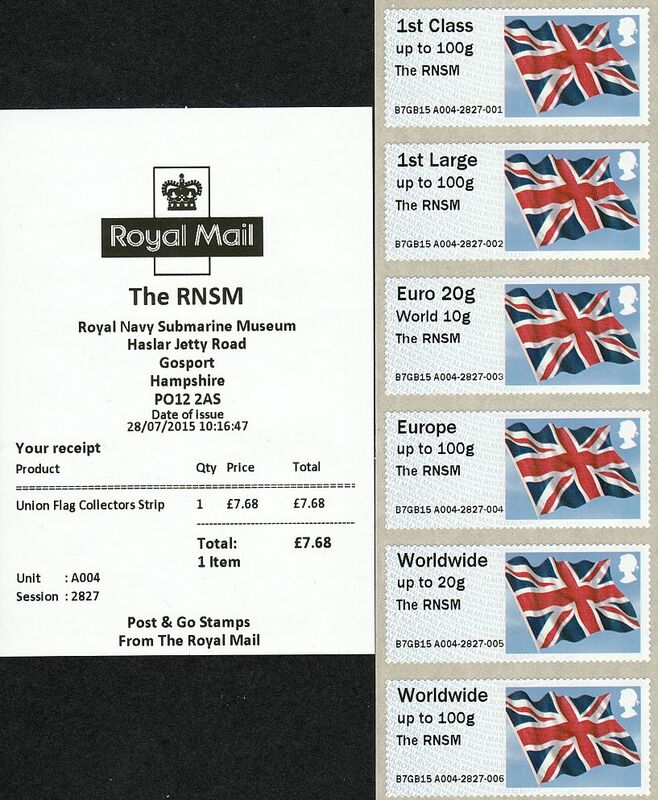 Thanks to Chris for providing images of the Union Flag and Machin stamps and receipts from the Royal Naval Submarine Museum (HMS Dolphin if I recall correctly) in Gosport. The flags are undated, and the Machins are coded MA13. 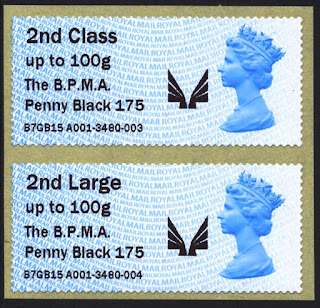 Thanks also to Vince who reports a fascinating software error at the BPM which sees the Airmail logo included on stamps with the Penny Black inscription! 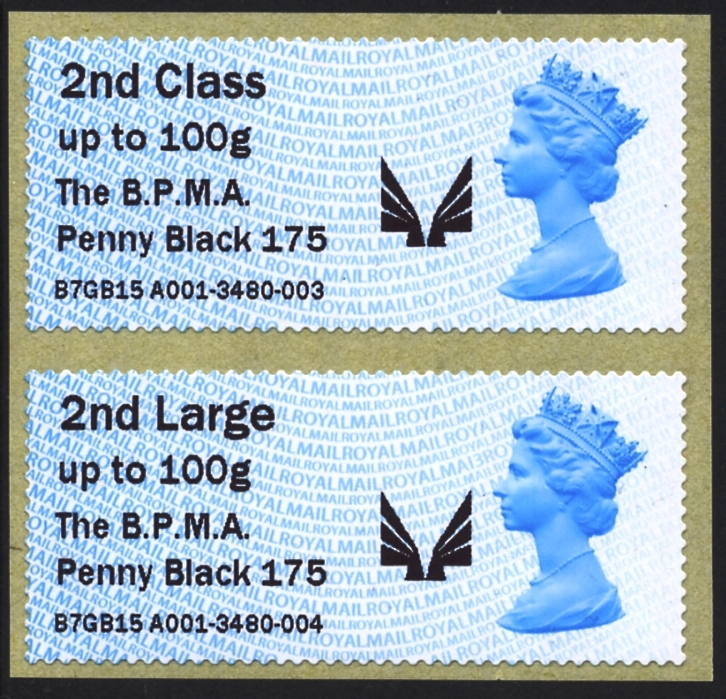 For a short while the PandG machine at BPMA developed a default problem, resulting in the 'airmail' logo appearing with the Penny Black text. The fault was caused when a major software upgrade took place on the evening of Tuesday 10th July. The error was available only on the Wednesday and Thursday morning until it was switched off. The corrected strips with the Maltese Cross reported to be in a different position to the previous versions. 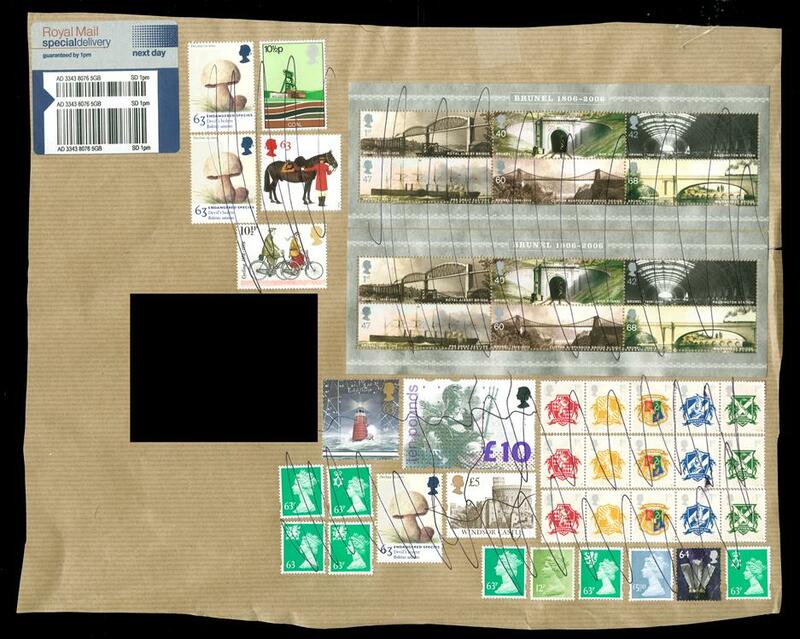 Approx 30 Collector's Strips of both 1st and 2nd class were bought. 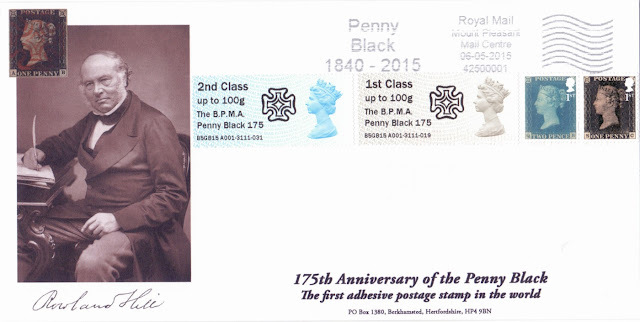 The Penny Black imprint will cease at close of business on 7 August, according to the IAR website. Once again news appears on the IAR Website ahead of being confirmed authoritatively by Royal Mail. A new (non military museum) static site has been located for a new Post and Go Kiosk A010. The site has been surveyed and will be installed towards the end of August 2015. Full details will be provided on the Royal Mail website when an installation date is confirmed. See August update. 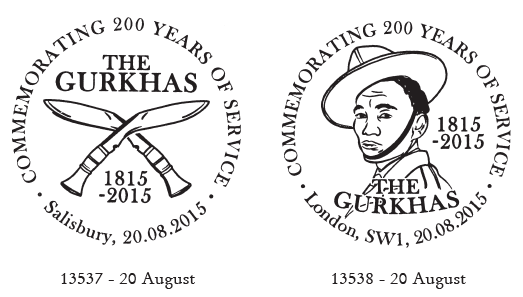 Gurkhas Commemorative Sheet - 200 years of service. 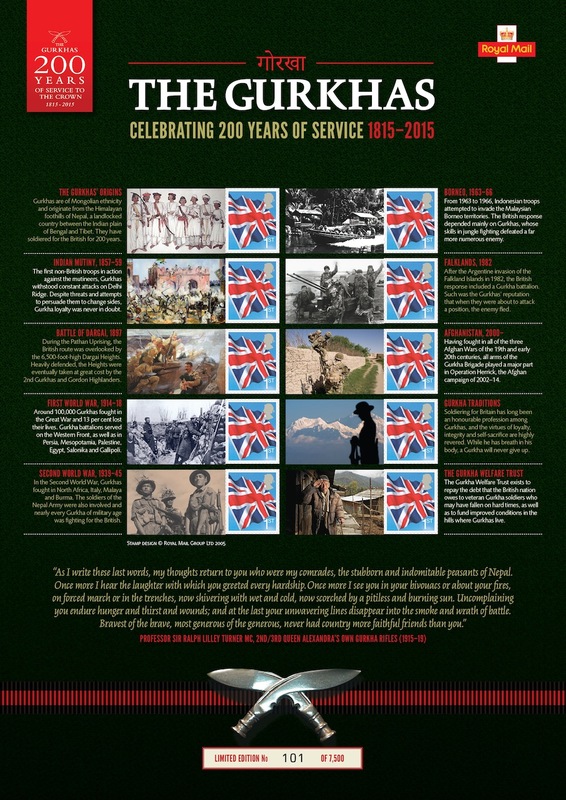 Royal Mail's next premium-priced commemorative sheet celebrates 200 years of service by the Gurkhas. 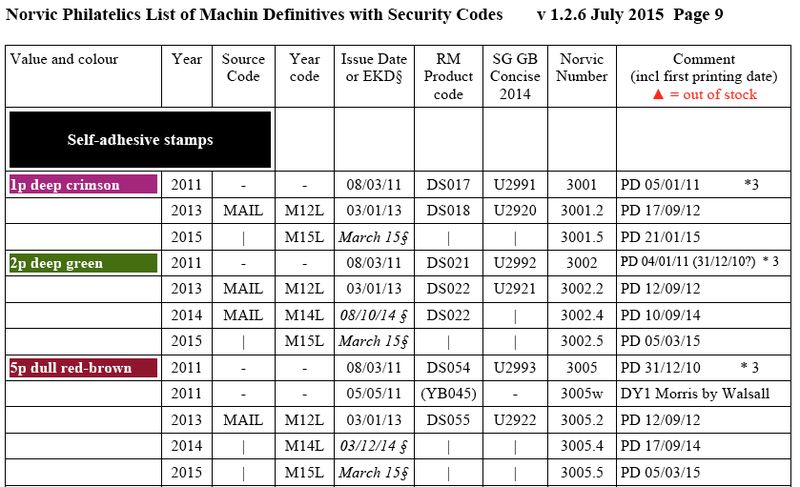 The sheet will be issued on 20 August 2015. 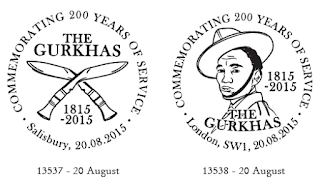 The first Gurkha regiment was formed in 1815. Originally part of the British Indian Army, they fought Pathans on the frontiers, dacoits in Burma and mutineers in India. With six battalions on the Western Front, four in Gallipoli and others in Mesopotamia, Egypt, Palestine, Persia and Salonika, Gurkhas were prominent in the First World War, and similarly so in the Second World War, where they served in North Africa, Italy, Malaya and Burma. After 1947, Gurkha regiments were divided between the armies of independent India and Britain, with British Gurkhas in the forefront of operations in Malaya and Borneo, and subsequently taking part in the Falklands campaign, and more recently in Bosnia, Kosovo, East Timor, Sierra Leone, Iraq and Afghanistan. 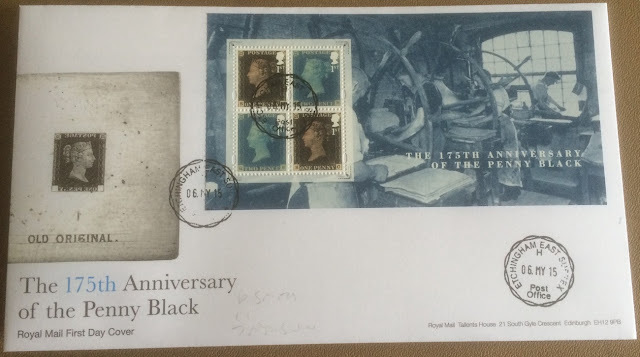 This Commemorative Sheet in a numbered limited edition of 7500. 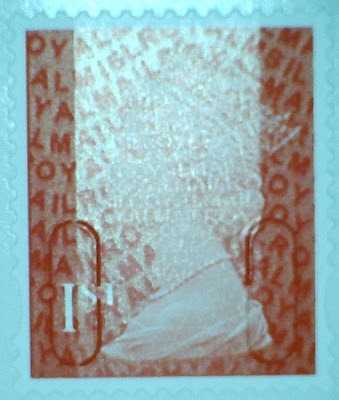 Two special postmarks have been announced coincident with the issue of this sheet. 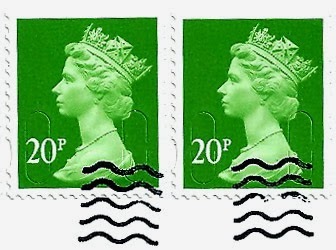 Both are available from the London Special Handstamp Centre. The June slogans post has been updated today with some different examples of slogans that were reported earlier. 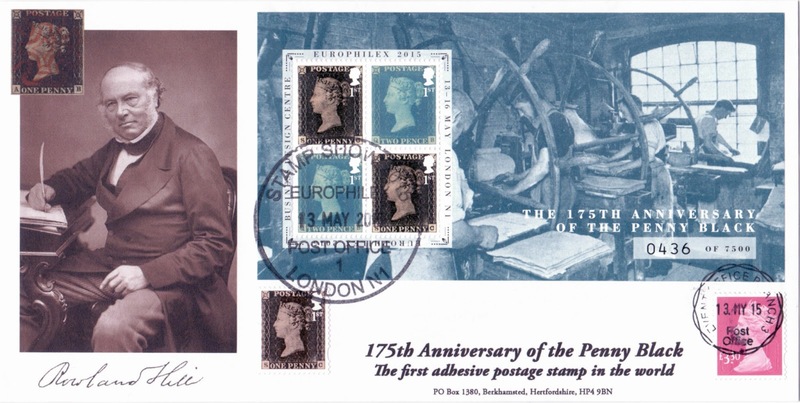 "[In addition to the new stamps] The anniversary will also be marked with a special postmark on all stamped UK mail between 16 and 18 July. It will read; ‘75th anniversary Battle of Britain’". As the dates they quote usually refer to when the mail is delivered, it suggests that this will be used from 14/15-17 July. 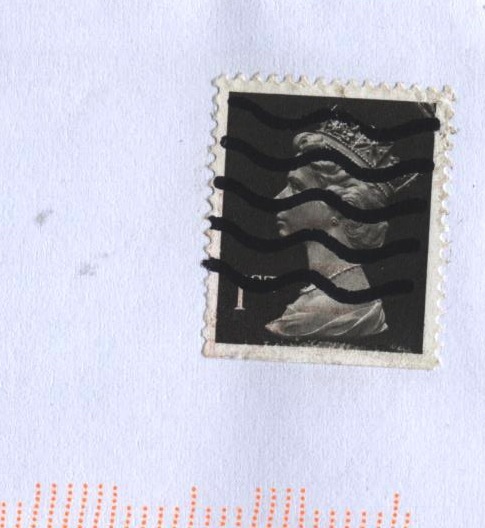 However, DP has sent this example from Manchester used on 9 July 2015! I look forward to seeing more examples used in the coming week! The first example of the Battle of Britain slogan used in the correct period - and on the first day of issue of the stamps. 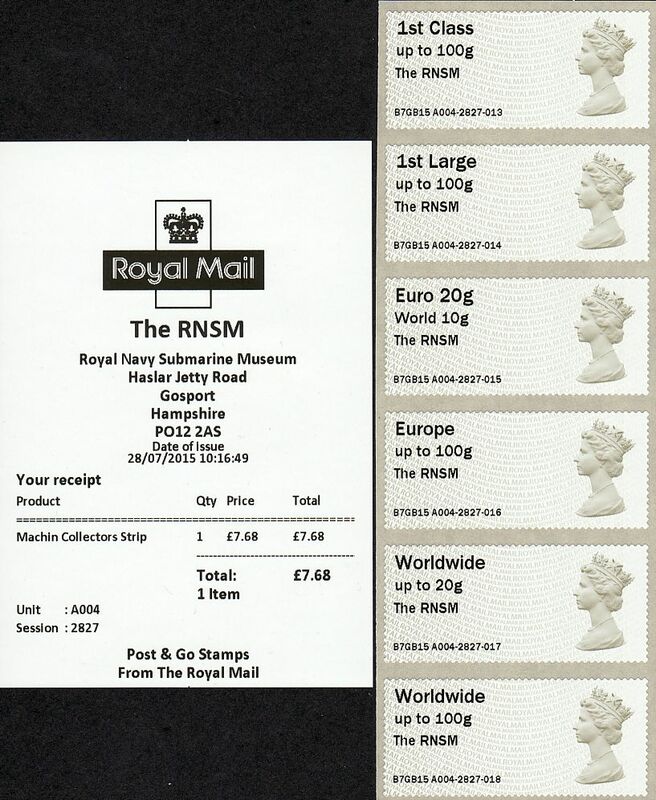 Thanks to Geoff (GBCC) on Stampboards. and Sheffield, remarkably on 9 July! Leaving aside the 'Postcode' and 'Stroke Association' postmarks which are used between these specials, this is (by my count) the 30th different slogan postmark this year already! 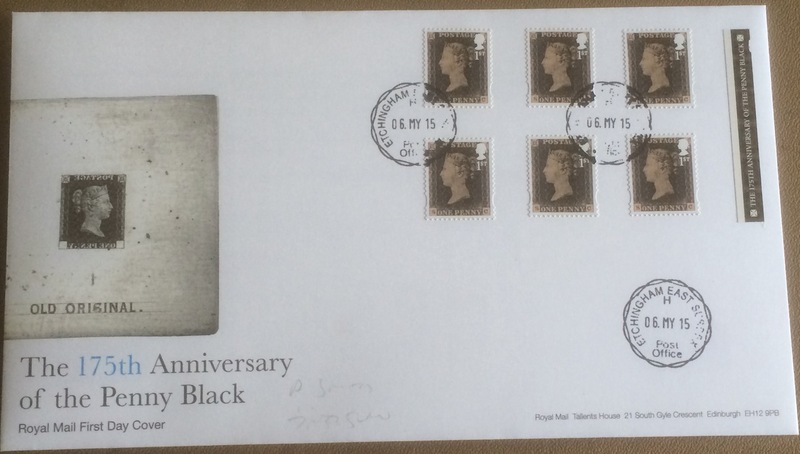 That's counting the two uses each of the Penny Black and the Princess Charlotte slogans as one each only. 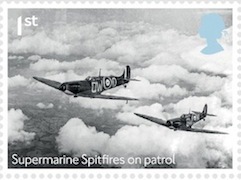 Fighter Planes and Bees on the next two stamp issues. 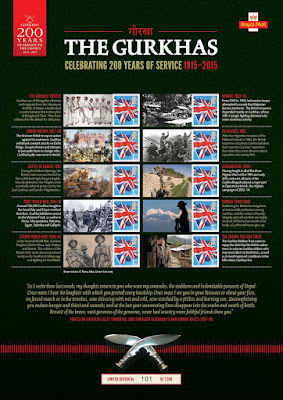 On 16 July 2015 Royal Mail will issue a 6-stamp miniature sheet to mark the 75th Anniversary of the Battle of Britain. 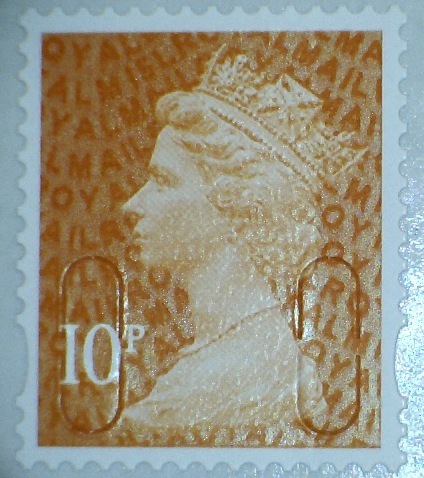 I think a set of stamps would have been better as they would have been more likely to see general use. A retail booklet would also have been good, but we have what we have. 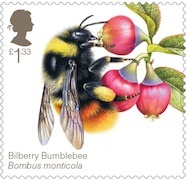 The 18 August 2015 issue does include a retail booklet and a set of 6 attractive stamps showing Bees of Britain, but also a less attractive miniature sheet, devoted to the habits of the Honeybee. 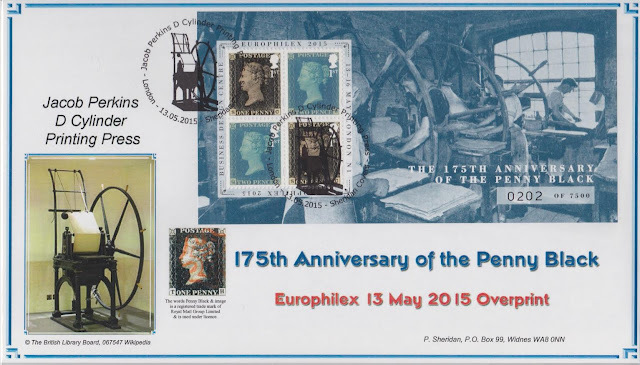 Full details of both issues - including some special postmarks for the Battle of Britain - are now on our website.